Also please understand that most bee removal specialists are overwhelmed beginning in March with calls. In peak season I personally receive between 30-40 calls per day – and do 1-3 full removals per day. If I do not answer the phone, I am probably in a hive – so please do leave a message and I will return the call as quickly as possible. My bee line is 469-251-2BEE (2233) – please DO read the removal information links and FAQ links below, however. I will ask you (a) How long the bees have been there. (b) How high from the ground is their entrance. (c) Your location, and (d) for any photos you can text to me to help assess the structure overall and zoomed in photos of where the bees are entering/exiting. 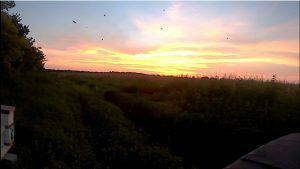 NUCs are $200ea for the 2019 season. (Cash payment price). These bees will be provided in a corrugated plastic EZNuc box – ready to transfer to your permanent woodenware. They should be ready last week of April or 1st week in May – 2019. If reasonable distance – we can arrange for delivery (2 nuc minimum) – and I can install into your readied woodenware – for a $50 delivery fee. In all cases – purchase and pickup/delivery needs to be personally scheduled. All customers will be contacted to communicate availability and when pickup dates and times will be scheduled. After purchase, you will need to carefully move the frames of bees to your prepared woodenware for them. This can be 8-frame or 10-frame boxes. The safest way is to pick one of the outside edge frames that is either empty, or has the nectar/resources on it to remove and place first. Then the other frames can be pulled away separately and placed into their full size hive body. Watch each frame closely for the queen, and the brood frames for freshly laid eggs as well as various stages of larvae and capped brood. It is highly suggested that you also have a feeder available for the bees. Internal frame feeders, or a feeder that sits on top of the brood box for the bees to access from inside will reduce robbing from other hives or colonies in the area, and will encourage the bees to draw wax on the additional frames in your hive and maximize the population (and their hone/food stores) before entering the next winter. Reduce the entrance down to an inch or so to further reduce any robbing activity from feeding your bees. Sometimes placing a robber-screen or some blockade in front to the entrance will discourage robbing activity. Varroa Mite management information HERE. I will treat all nucs for Varroa with 1 oxalic acid vapor treatment. Please do reasearch methods for varroa management – and use a method that works for you. My link to the left is NOT a comprehensive list of ways to manage or eliminate varroa. 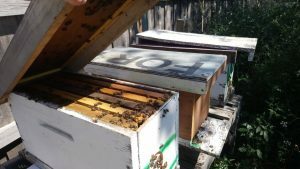 Note: This is a livestock/NUC hive purchase only – and does not include classes, “mentoring” or consultation on how to manage or care for honeybees. Bulk Purchases and hive hardware and installation can also be arranged. Contact Rex Smith at 469-251-2BEE (2233) if you are interested in leasing or purchasing full hives to qualify for Texas Ag 1-D-1 valuation to reduce property taxes. If so, having honey bees can help you qualify. We sell bees hives with an established colony (seasonally), but for those that may not want to get into beekeeping, we also lease our hives to land owners for a reasonable fee. 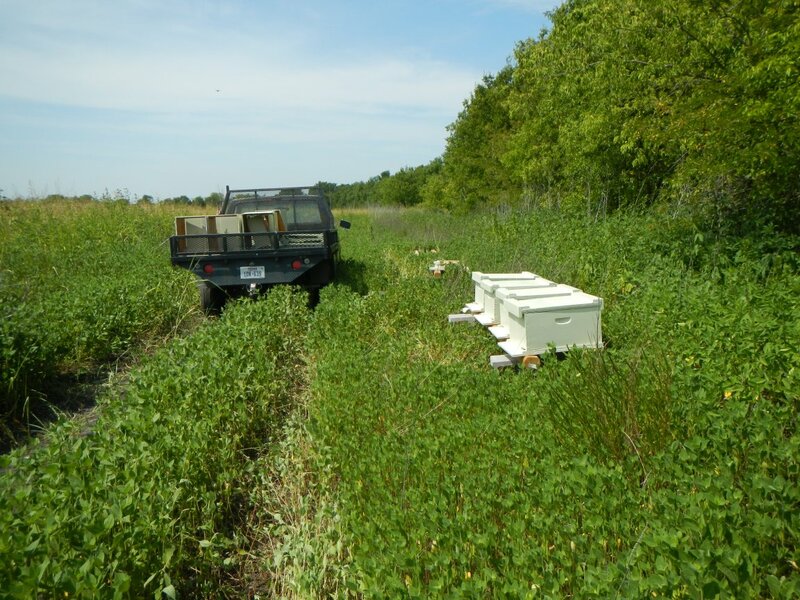 We do everything to manage and maintain the bees, and you reap the rewards of the tax breaks. 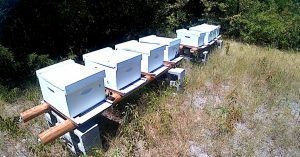 Lease our Honey Bee hives to qualify for an Ag Valuation and leave the Beekeeping to Harmony Hollow Apiary. Call Rex at 469-251-2BEE (2233) for more information and pricing. 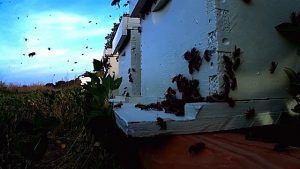 Texas law, effective January 1, 2012, made it possible for beekeeping to qualify for an Agricultural Valuation (commonly called “ag exemption” – see below) on property taxes. This is covered in the Tax Code under Chapter 23, Subchapter D, Sect. 23.51 (1) and (2). An Agriculture Exemption is not actually an Exemption but rather a Special Valuation. If a portion or all of a property is deemed eligible to receive an Agricultural Valuation, that property will receive a Production Value along with its Market Value. The tax savings that a property receives depends on the current Market Value of the property and what type of Ag Valuation you are requesting. For example, Native Pasture areas can have a lower Ag valuation than Dry Crop areas and generally both are lower than the market value that the taxes would normally be based on. There are several key phrases and requirements to this law. Sect. 23.51 (1) covers the definition of “qualified open-space land”. Specifics state land that has an established agricultural use history for five of the preceding seven years. Record keeping is critical. Registration and permitting with Texas Apiary Inspection Service (TAIS) helps establish this history. Wording of the law states agricultural use to the degree of intensity generally accepted in the area. Each local appraisal district sets their own standards as the accepted degree of intensity. 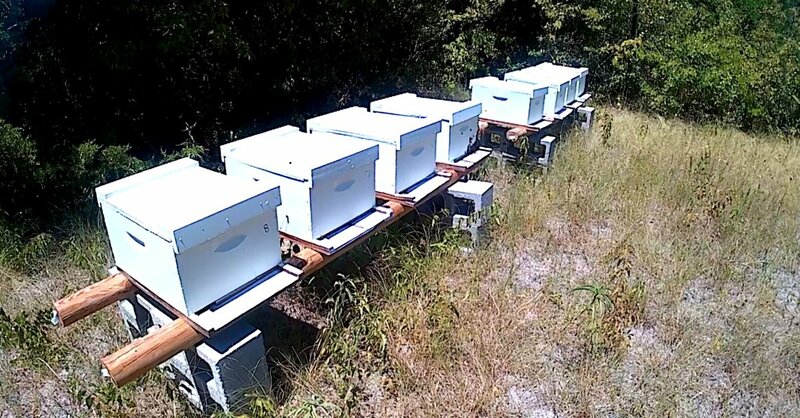 Most appraisal districts use a minimum of six colonies (beehives) as a standard. That is the accepted definition of an apiary from Texas bee law under the Agriculture Code, Title 6, subtitle A, Chapter 131, Sect. 131.001 (2). Size of qualifying acreage is not less than 5 or more than 20 acres. Remember the definition of agriculture use. Losing an acre to a homestead exemption has to be accounted for on acreage. Lastly, it is important to stress the fact that each local appraisal district can set their own standards and requirements for the beekeeping valuation. Please contact your local appraisal district for guidance and minimum requirements. Most now have this information available on the county appraisal district website. We are based near the Dallas, Texas Metroplex. However, we cover a large portion of North and East Texas. Contact us to reserve bees for your property. Preheat oven to 350°F. Spray an 8-by-8-inch baking dish with non-stick spray. 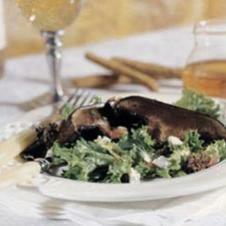 In a small bowl, stir together uncooked quinoa with cinnamon, making sure it is coated completely. Pour quinoa over bottom of prepared dish. 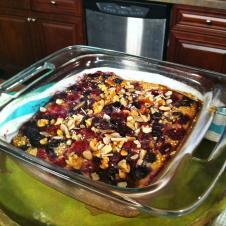 Scatter the berries and nuts on top of quinoa, making sure to spread evenly. In a small bowl, lightly beat the eggs. Add the milk and honey and whisk together. Pour egg mixture on top of quinoa and fruit. Bake 1 hour or until the breakfast bake only has a small amount of liquid remaining. Serve warm. 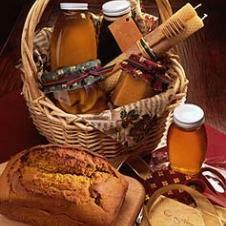 In large bowl, cream honey with butter until light and fluffy. Stir in pumpkin. Beat in eggs, one at a time, until thoroughly incorporated. Sift together remaining ingredients. Stir into pumpkin mixture. Divide batter equally between two well-greased 9 x5 x 3-inch loaf pans. Bake at 350°F for 1 hour or until a wooden pick inserted in center comes out clean. Let loaves cool in pans for 10 minutes; invert pans to remove loaves and allow to finish cooling on racks. A view from within the house while removing the comb. There was NO sign of a laying queen in this colony. 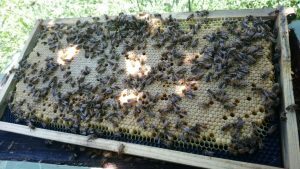 No eggs, larvae or brood – and very little pollen (protein source) in the comb. They will likely be combined with a colony that needs more numbers to survive winter. Enjoy the view! Care MUST be taken when cutting into any unknown void (i.e. drywall) to ensure that no electrical, plumbing, gas, etc. lines are damaged. These bees were very docile – and I suspect they had been in the space for well over 2+ years – even though a neighbor just recently noticed bee activity outside. The comb was a very dark brown color – indicating some age to it. After the bee removal was complete, I was able to caulk the entrance the bees were using – from the inside – then filled that wall-space with insulation. In this case, the homeowner has a neighbor that is performing the drywall repairs. Enjoy the video! Please DO subscribe to the channel, and click the “thumbs up” button. Comment and let me know your thoughts on the work as you peruse my videos. What? Why would you do a removal or ANY bee work without a smoker? It can be done. Should it be done? Probably not… But with proper knowledge of how to deal with the bees, it’s possible…. 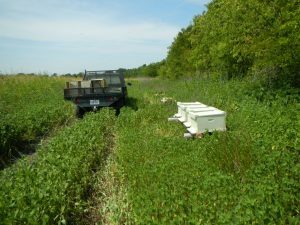 Now – a month after this removal, the bees are doing well in the nuc box they moved into.